Photographer Nakeya Brown’s series “The Refutation of ‘Good Hair’” is a sly, compelling visual conceptualization of “good hair” that forces the viewer to consider the ludicrousness of the divisive phrase – the starkly presented portraits include black women literally eating Kanekalon and hair wrapped around a fork in an otherwise standard place setting. Black women have long been the favored subjects of the 25-year-old’s aesthetically-pleasing work but the birth of her beloved daughter Mia, and her experience shooting Louisiana’s plantation country for “Becoming Home” with friend and photographer Mariana Sheppard, instilled a desire within her to produce more enduring work focused on race and gender issues. In a conversation full of laughter, despite it being an early Saturday morning, an animated Brown discusses the fulfilling direction her work has taken, teases a new hair-centered photography project, and shares exciting news of an upcoming exhibition. I have previously seen your entertainment and fashion photography but “The Refutation of ‘Good Hair’” was your first idea-based series that I had seen. Hair is the main focus of this series and the black female body is really important in your work, overall. Will these subjects be the main focus of your work moving forward or only for a few more series? Where do you see this going? Nakeya: I definitely see [myself] focusing on the black female form and black identity… at this time in my life. Before when I was making [my] work, I knew myself but I didn’t really know myself and I didn’t have to question [how] my understanding of myself … would affect another person. Since having a daughter, I’m constantly thinking, “How do I want her to perceive herself? How do I want her to understand the way society views her?” … You need to ask yourself these questions. I feel like the work that I’m making is as much of an exploration of those answers as it is something that I can talk to my daughter about. … I definitely want to do more concept-based images that, [when] people look at them, [they] spark conversation. …There’s substance there. … I’m actually working on a new project right now. It’s very much in the early phases but it definitely has to do with hair. Not so much the language of hair and how we describe it, but the processes of how we handle our hair and how we treat our hair. So … I don’t think this is a phase. I think it’s something that’s very much a part of me. It just feels right (laughs). I know you said that this new project is in the beginning stages, but is there any aspect of it that you don’t mind speaking on? Do you have any ideas of the processes you want to conceptualize in this piece? 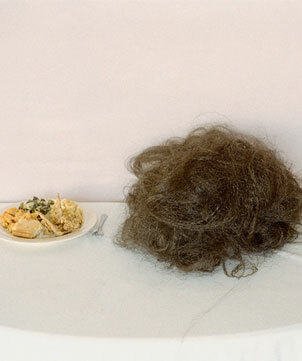 N: It’s a combination of some still life set-ups interacting with hair. … [W]ith the “Refutation of ‘Good Hair’” you see a woman eating the hair and you look at it and it kind of puzzles you a little bit to the point where you have to ask, “Okay, now you have to tell me about where this came from.” It’s sort of along those same lines where it’ll be a woman and she’ll be interacting with hair and she’ll be doing something sort of like, “So you’ll have to tell me why she’s doing this.” … It’ll sort of be more in an environment as opposed to the “Refutation of ‘Good Hair’” which is more portrait. … I want to give the images more depth. But it’s super early … [and] I don’t even have a title for the project yet. But just to let you know, it’s about women and their hair and processes that we go through when dealing with our hair to try and make it “presentable” or “beautiful.” I’m really excited to see this. This will be great. N: Yay! (Laughs) It’ll be a fun project. Any really gratifying, poignant memories from someone reacting to your work that made you feel like, “Okay, I’m moving in the right direction”? Especially with your conceptual work? N: I definitely think when Ayana Byrd contacted me that was like, “Wow.” I’m not even sure how she found out about “The Refutation of ‘Good Hair’,” but when she contacted me and said she wanted to do an interview that was another exciting feeling. I was like, “Wow. Maybe this does mean something to other people besides me.” I read her book when I first went natural at 21 and I found [it to be] so informative, so enlightening. I never in a million years thought that she would ever know who I was. And the fact that she contacted me and said she saw the series and loved it and she has this new website that she’s working on, and it’s a space where women can share and talk about their hair and their experiences with it, was just really humbling. So I’m kind of just like, “Wow. People like it!” (Laughs) I was very nervous at first. I’m like, “Are people going to get this? Are people going to understand? Are people going to call me a radical? [Will] people think that I’m this crazy hair girl?” But it’s just been well received overall by anyone who’s seen it and it feels great. It really feels good. Do you have any other series, projects, exhibitions or shows that are coming up? N: I have people who are interested in showing “The Refutation of ‘Good Hair’.”… Different galleries will have open calls where they have an exhibit and you apply to it and if they like your work they show it. There’s this exhibit in Chicago that’s curated by Carla Williams. It’s called “The Photographic Self” and it’s all about the black woman’s relationship to her body and how you explore that relationship through photography. I applied for it and I find out today if I got accepted into it. It was an open call, so a bunch of people applied to it and they curate who they want in the show. So if I get in, that would be great. … [A] lot of people are interested in “The Refutation of ‘Good Hair’.” … There [are] a lot of different places, a lot of different unknowns, but possibilities that are out there right now. So it’s exciting. Update: Select photos from the “The Refutation of ‘Good Hair’” will be featured in “The Photographic Self” group exhibition at Chicago’s Woman Made Gallery from September 6 to October 24, 2013.